1.e4 c5 2.¤f3 e6 3.d4 cd4 4.¤d4 ¤c6 5.¤c3 d6 6.Ґe3 ¤f6 7.Јd2 Ґe7 8.f3 0-0 9.0-0-0 a6 10.g4 ¤d7. I played this variation for the first time; therefore, I wasn't precise enough. It is better to play 10...¤d4 straight away. 11.h4 ¤d4 12.Јd4. The main move here is 12. Ґd4. Look at one of the latest games on this subject: 12.Ґd4 b5 13.g5 Јc7 14.ўb1 b4 15.¤a4 Ґb7 16.Јb4 Ґc6 17.¤c3 ¦fb8 18.Јc4 ¤e5 19.Јe2 Ґb5 20.Јf2 Ґf1 21.¦hf1 ¤c4 22.b3 ¦b4 23.¦d3 ¦c8, and Black obtains an active play for a pawn (Aagaard – P.H. 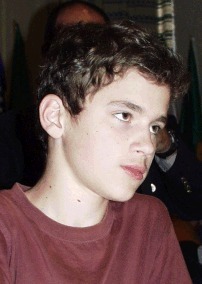 Nielsen, Malmoe 2005). 12...b5 13.Ґg5 ¤f6?! This response is not entirely good. Better is 13...Ґg5 14.hg5 Јg5 15.ўb1 Јe5. 14.Ґf6. A principled move. Less promising for White is 14.h5 e5 15.Јd2 b4 16.¤e2 Ґe6 with an unclear play, in my opinion, Black has better chances. I knew that here Black should play 15...Ґb7, whereupon the strong dark-squared bishop is going to compensate a missing pawn in the endgame, but in this case it is most likely that the game would end as a draw. So I decided to intensify the struggle. This decision made the game more difficult for both opponents and demanded a more precise play. Later it turned out that we failed to avoid mistakes... However, the game became more interesting. 16.e5! b4™ 17.ef6. In case of 17.¤d5 Ґd8 18.¤b4 Ґb7 Black has a quite good compensation for the material –White's position is poor and the kingside is weak. 17...bc3 18.fg7 ¦e8. After 18...ўg7 19.Јd4 e5 20.Јc3 Black struggles for a draw. I have planned to offer a piece sacrifice on this move yet playing 15...Ја5. 19.Јc6. During the game I was afraid of 19.Ґd3 Ґb7 20.Јf4, and a move that suggests itself (20...cb2 21.ўb1 Ґd5 22.c4) leads to a defeat. However, after the correct 20...Јa2 21.bc3 ¦ac8 22.Јh6 Јa1 23.ўd2 Јc3 24.ўe2 f5 the advantage passes to Black. 19...Ґb7!? After 19...Ґd7 20.Јc3 (20.Јe4 Ґb5!›) 20...Јc3 (20...Јa2 21.¦d7 Јa1 22.ўd2 ¦ad8 23.¦d8 ¦d8 24.ўe3 Јc1 25.ўf2ќ) 21.bc3 Black would find himself in a difficult endgame that he avoided having made the move 18...¦е8 instead of 18...ўg7. However, it was possible to play 19...cb2 20.ўb1 Ґd7 21.Јe4 Ґb5 22.Ґd3 Ґd3 23.¦d3 with a complicated position, though White's odds are a bit higher. 22.bc3? Now it is turn of my opponent to be wrong. However, here it is not so easy to make a right decision. 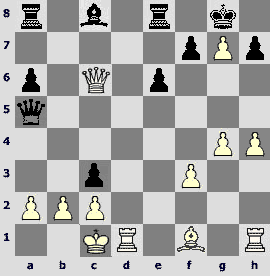 22. b3 ¦a8 leads to an unclear position, because one cannot allow the black rook on a2. Right would be 22.Јd6 Јe3 23.ўb1 ¦b2 24.ўa1 ¦a8 25.Ґa6 (25.Ґc4? Јa7) 25...¦b6 26.Јe7 ¦ba6 27.¦d8 ¦d8 28.Јd8 ўg7 29.Јg5 Јg5 30.hg5 ¦a5 with good chances on a draw as Black. After the text move Black gains the advantage. 22...Јe3 23.¦d2 Јc3 24.¦d3 Јe1 25.¦d1 ¦b1 26.ўb1 Јd1 27.ўb2 ¦b8 28.Ґb5 Јh1 29.Јc6. 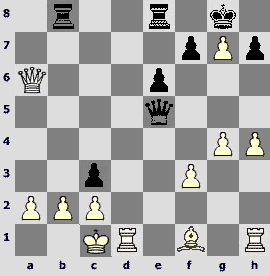 Black managed to obtain equality, but provided the right play White could make a draw. However, I think that it is always unpleasant to play such positions as a defending side. Indeed, Black gradually succeeds in coordinating his pieces and using the main disadvantage of White's position – an open location of his king. 29...Јh4 30.a4 Јd8 31.Јc3 ¦c8 32.Јd3?! One should have kept the queen on e5. 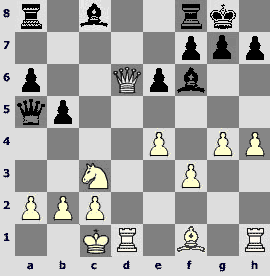 The centralized queen would contain the actions of black pieces. After the text move the chances of Black considerably increase. 32...Јf6 33.ўb3 ¦a8. Premature is 33...Јa1 because of 34.c4. 35.a5? Perhaps, it is a decisive mistake. The bishop now lacks support, and it also weakens king's position. It was better to wait: 35.ўа2. 35...¦b8 36.Јd3 Јc7 37.ўa4 ¦d8 38.Јc4 Јe5. 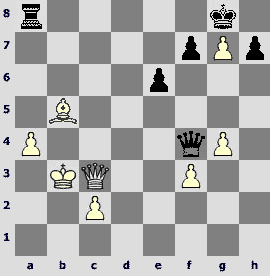 The open position of White's king begins to affect the situation. 39...¦d4 is threatening. 39.c3 ¦d1 40.a6 ¦a1 41.ўb4 Јh2 42.Јd4. Leaving the bishop without protection White speeds up his defeat. 42.f4 Јb2 43.ўc5 ¦c1 44.ўb6 ¦c3 45.Јa4 could prolonging the struggle. 42...¦b1 43.ўa5 Јc7 44.ўa4 ¦a1 45.ўb3 Јa5 46.Ґa4 ¦b1. Surely, one could not take on a6 here because of a perpetual check. 47.ўa3 ¦b8 48.Јc4 ¦a8 49.Јb5 Јc3 50.Ґb3 Јc1 51.ўb4 Јf4 52.ўa5 Јc7 53.Јb6. A Zeitnot blunder. Also after 53.ўa4 Јd6 54.ўa5 ¦b8 55.Јc4 Јb6 56.ўa4 ¦a8 the result of the game is beyond any doubt.